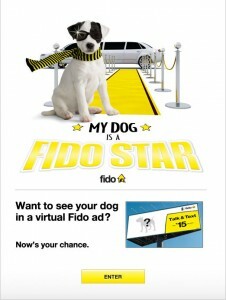 If you’ve ever seen those Fido billboards that have the dogs on them and admired them… now is your chance to pimp out your puppy as Fido has created an Facebook app that gets you to put your dog in a Fido ad. It’s a viral initiative where you can share with other dog lovers, friends etc… this also promotes their $15 plan. But is this app really needed? Why go through the steps when you could easily send a pic of your dog to your friends?